One of my main tasks is to keep a close eye on performance. Every time we have a major release, I have to start looking at performance, find main culprits and fix them. Well, not me, but work with developers and find a solution to the issues at hand. And our databases are rather large, historical databases are in the terabytes, current databases are in the hundreds of gigs, if not terabytes as well, few of them. Statistically (in my work), partition elimination in all its flavors (aggregating partitioned tables, etc) is one of the recurring patterns in the offending queries I found over the past few months. Actually, it’s the lack of it :). Now, what’s so special about it? Well, it helps keep I/O down to an acceptable level by not reading more data pages than we actually need. In fact, there are few other complementary methods, like proper WHERE clauses (SARGable WHERE clauses, etc) which can be pushed down by the query optimizer and so on and so forth. 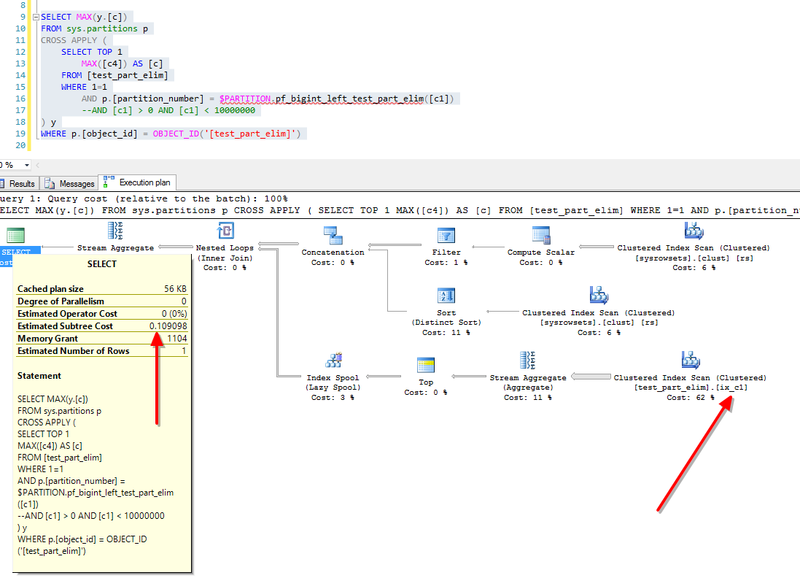 Apart from the obvious issues with the above statement, the MAX value was retrieved alright, but the problem was that it had to scan the whole table (couldn’t add any WHERE clauses to it). The fact that the table was partitioned on a datetime column, made me think of ways of getting somehow the partition boundaries and use partition elimination. [Column1] was an integer value which only increases, so my initial thought was, of course, that the MAX value would be in the last ones inserted. Table was also one of the biggest we have in that database, was heavily read from and written into and due to some constraints, I wasn’t able to add any index that would help. My first attempt was to limit the search to only few days worth of data. There was an improvement, it read far less records (39K opposed to 43 millions), it scanned only the last few partitions, but business rules made this approach not feasible. So how would I go through all the table without being so expensive ? 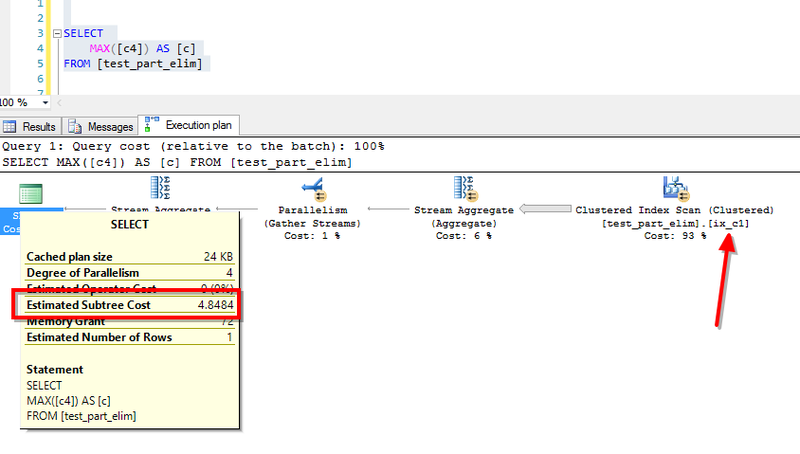 One way would be the direct way, using the WHERE clause which would contain the required criteria. But that was already deemed unfeasible. And then there’s an indirect way, which has a limited applicability, but it’s a beautiful trick especially when the direct way is a bit difficult to achieve (like in my example). I learned this from a colleague of mine, Octavian Vaida (Thank you, Tavi), and because I find it really interesting, I decided to share it. So, let’s set up the test environment. 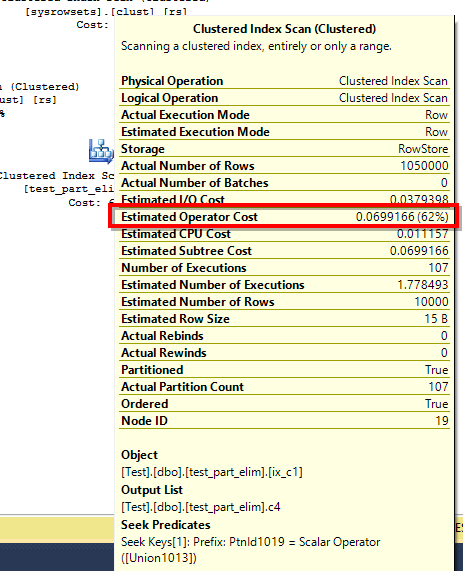 For the sake of experimentation, I’ve swapped the columns from my work query and I decided to see if the same applies when I’ll try to get the MAX of a DATETIME column on a table partitioned on an BIGINT column. First we create a database and then the required objects: one partition function and 2 partition schemes (one for data and one for indexes). 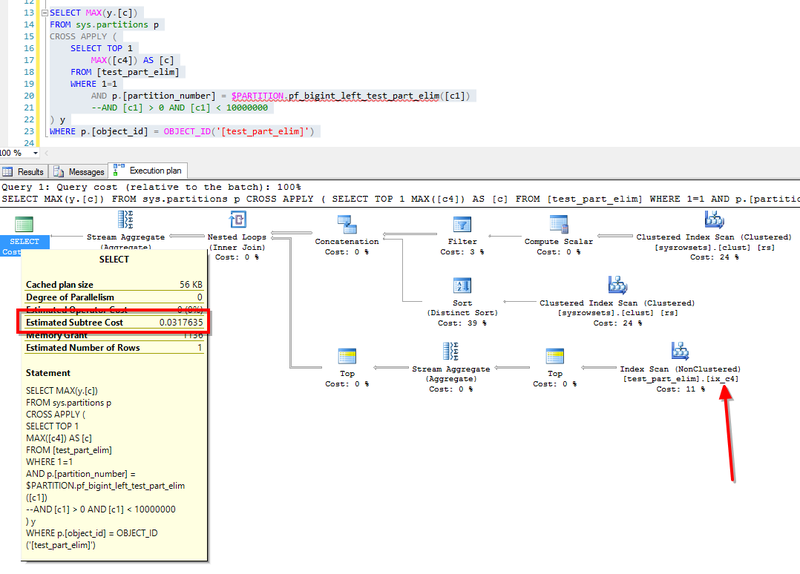 The script that creates the PF and PSs was generated by this (Generate_PFs_and_PSs.sql) script and certain sections of the script have been removed, as are not relevant for our case. Feel free to download it (you’ll have to rename it from .DOC to .SQL or .TXT), use it, change it, improve it. Second, we populated the tables. Table 'test_part_elim'. Scan count 107, logical reads 5145, physical reads 0, read-ahead reads 0, lob logical reads 0, lob physical reads 0, lob read-ahead reads 0. Let’s test the same but with MAXDOP 1. For starters, the execution plan looks totally different. 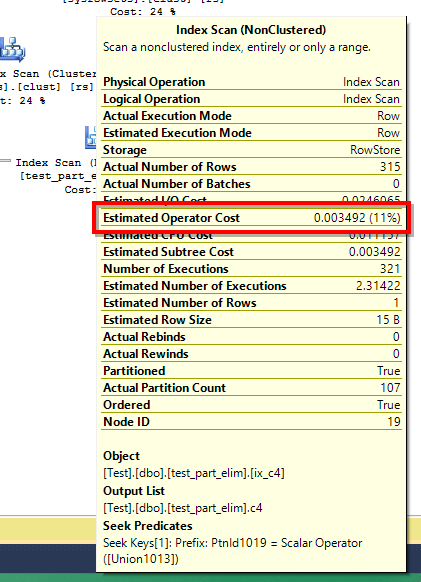 If we’re examining the execution plan, we’ll see that the subtree cost is now 0.109098. That’s a dramatic change in cost, even though the script scans all 106 partitions in both cases. The operator cost also dropped considerably. Table 'Worktable'. Scan count 428, logical reads 1281, physical reads 0, read-ahead reads 0, lob logical reads 0, lob physical reads 0, lob read-ahead reads 0. Table 'sysrowsets'. Scan count 2, logical reads 14, physical reads 0, read-ahead reads 0, lob logical reads 0, lob physical reads 0, lob read-ahead reads 0. Some may argument that the costs we’re seeing would drop if we would have a covering index in place. 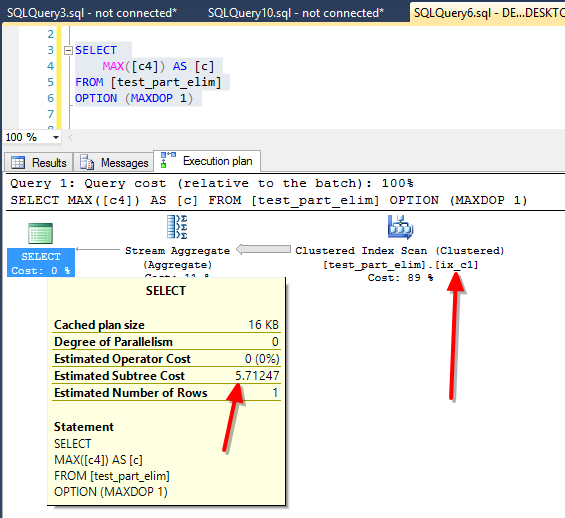 So, what if we create a covering index for column [c4], will the query have a lower cost with the second approach ? One way to find out… Let’s create an index first. And let’s see what’s happening with the queries. First thing I noticed, is that the new index is being used. With script 1, we have these I/O figures. Table 'test_part_elim'. Scan count 107, logical reads 3255, physical reads 0, read-ahead reads 0, lob logical reads 0, lob physical reads 0, lob read-ahead reads 0. The logical reads have dropped by approximately 30%.. Execution plan looks a bit different (we’re not having a parallel plan because of the new index), subtree cost have dropped a bit from 5.71247 down to 4.31247 and operator cost dropped as well, from 5.08247 down to 3.68247. It’s good, but let’s see the second approach. With script 2, the I/O looks way better, with only close to 12% from the whole reads previously. Table 'test_part_elim'. Scan count 321, logical reads 630, physical reads 0, read-ahead reads 0, lob logical reads 0, lob physical reads 0, lob read-ahead reads 0. Table 'sysrowsets'. Scan count 2, logical reads 16, physical reads 0, read-ahead reads 0, lob logical reads 0, lob physical reads 0, lob read-ahead reads 0. 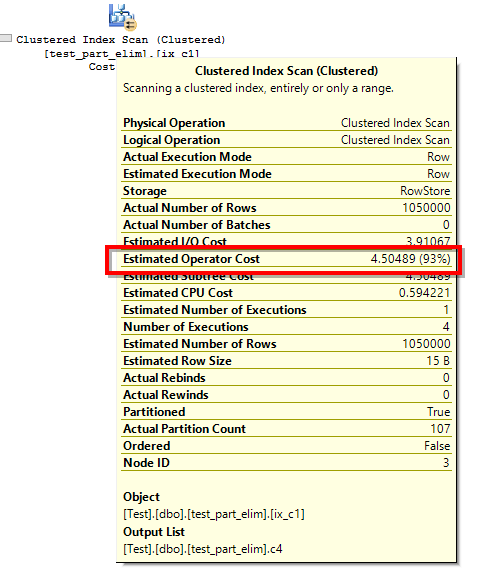 The execution plan looks similar but check that subtree cost and index scan operator cost! We can go even further with our tests, by adding a WHERE clause, on one of the non-partitioned columns, maybe even on the same C4 we’re reading. To not make this post too long, let me just say that during my tests, the same improvement pattern has been seen when using WHERE clauses. Here are 2 scripts I’ve used to test. 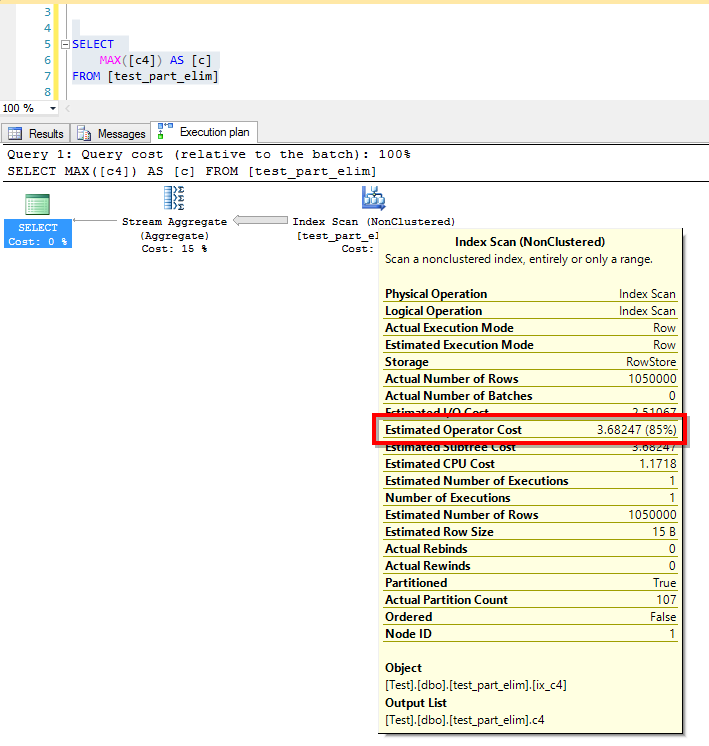 In the execution plans, check the subtree costs and index scan operator costs and do the math yourself. And how do we explain this ? 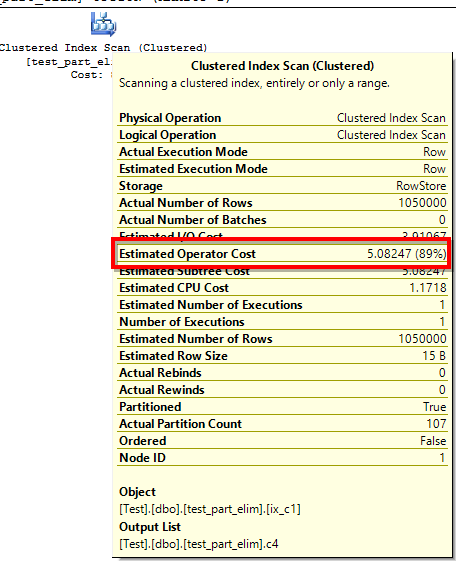 With method one, we’re scanning all records in all partitions in one go (with or without parallelism) and this is how we’re getting the max value. With method 2, we’re getting one MAX value for each partition and then a MAX across these MAX values is calculated. This explains why the cost dropped so considerably. Hm… apart from the usual stuff you would find on the web, I’ll add another one: just make sure that the machine name is the same as the SQL Server (default instance) name. In my case, the computer name displayed: DR20 server, while the SQL Server default instance name was: DR20DB server. Once the SQL Server default instance name was DR20, everything went fine. I hope this helps some poor soul out there. This blog post is waiting for me to have some time for the past couple of months by now. It did bite me back then, and so it did yesterday. “Login failed. The login is from an untrusted domain and cannot be used with Windows authentication. Error source: Microsoft OLE DB Provider for SQL Server” – now, I must emphasize that I’m not going to reproduce the plethora of info that is present out there already, but instead I might be among the few selected ones that indeed had issues with AD domains. If you’re curious about that, read on; if you’re looking for how to enter some lines of code in some connection string, you better go have a coffee or something. Background: the company that I work for, migrated all their SQL Server 2005 servers (with DAS – Direct Attached Storage) to SQL Server 2008 clustering (on SAN). This obviously means a lot (I mean A LOT) of fun, such as deprecated code, and so on. Besides this, one of the required steps is to swap the IP addresses between the SQL Server 2005 machine and the SQL Server 2008 resource on the cluster (of course, anybody knows that SQL Server 2008 is just a resource on a 2008 cluster, right? – I learned this the hard way). “ONLY jobs that need to run to C:\Program Files (x86)\Microsoft SQL Server\80\Tools\Binn\DTSRun are failing. The ones that are running C:\Program Files (x86)\Microsoft SQL Server\90\DTS\Binn\dtexec are running fine. Rough translation of the above: all the jobs that running DTSX packages are running fine, while all the jobs that are running DTS (SQL Server 2000 – yes, I know, that old) are failing in SQL Server 2008. Besides that, when I run ping –a 10.0.0.31, I still get the name of the SQL Server 2005 machine, instead of the SQL Server 2008 cluster resource. This is something that happened early May, and I completely forgot about it. And it happened again yesterday. Sorry for all that blur stuff, but this is a prod machine. Anyway, as you can see, the IP address of my SQL Server cluster resource is 10.0.0.10. So instead of getting something in the line of “28DBCLU”, I still get the old SQL Server machine, which used to be “01db”. Again, oddly enough, this manifested itself only for the DTS packages, which are running DTSRun, found in the \80 folder. Solution? A very simple one, just ask the sys admins to make the necessary changes in the DNS (yes, that DNS, related to AD, DHCP, all that jazz). Also, it would be very helpful not to have hard-coded values in your hosts file. and master databases are not the same. My mail to SQL Sentry that will win me (yeah, right) a free seat to SQL Skills training! The amazing guys @SQL Sentry (www.sqlsentry.net) are giving away a chance to win a free seat to SQL Skills Internals and Performance training (check out the details: http://www.sqlsentry.net/sqlskillsimmersion.asp). Now, last night at around 2:30 AM I stepped down of bed, as the little ones (we have two kids) kept kicking me in the head for far too long. Since I’m a hopeless DBA, the very first thing to do is to open the laptop and check on the emails. I almost fell down from chair when I saw Paul’s email regarding your offer. And I said to myself ok, I’m still asleep and dreaming, let’s read that again in the morning. Which I did. And there it was, the offer. I live in Romania, which, by all standards, had a strict comunist regime until 1989. While it was strict in regards with computers (we didn’t even have a word for computer), there was a plethora of underground illegal stuff, such as cable TV. This way we got introduced to good movies with hot chicks. Movies that immediately after the Romanian revolution (December 1989 the revolution, early ’90ies for the rest of the story) turned into even more good looking chicks. Of course, the entire gang fell in love with such angels. Even back then we knew that we had no chance with them, but at least we could try to get something similar in Romania. By all standards, none of us were quite hot-shots, so we decided that the best way to pick up gorgeous girls is to have money – a truth that happens to be the same worldwide. It also happened that unfortunately all of us were raised to be honest, not to steal, all that jazz, so we realized that we would have to make a career that would pay enough money to stand out from the crowd. There you go, we got into IT. This was a big mistake for several reasons: as everywhere else in the world, the true hot shots never go to work, ever; as they say, if you work, you don’t have time to make money. But the worse was to happen: we all fell in love with this new… thing, which was computers. Not to mention that back then the Internet changed it all (yeap, I’m that old, I keep telling that Internet and internet are not the same). So before any of us could realize what’s happening, we pretty much forgot about the movies and the hot chicks and got our hands dirty into all sorts of things, such as networking (myself included) and programming (myself excluded). Fast forward a few years later, around the beginning of the millennia, most of us were working in the IT field (by the way, it is still growing exponentially in Romania). Now, there is an old saying: he who can do, will do; he who cannot, will teach. Of course, most of the gang members got to work, while I got to teach (as a technical trainer in various capacities). Quick jump into 2008: I got a job offer as a database administrator in SQL Server. Does it have icons? Can I work with a mouse? Yes. OK, I’m in. It was back then when I fell in love with the damn thing. Then I got to read great blogs from great people, such as Brent Ozar and Paul Randal, just to name a few. Back then, I would have said that thanks to them, I kept my love for SQL Server growing. Another quick jump into 2011: I got another job as a SQL Server DBA, but this time the mouse was the least of my worries. Just to give you an example: guys, do any of you know anything about clustering? None of us did. OK, you have three days to pick it up, we’re migrating all of our databases to SQL Server 2008 clusters. We did pick it up. This year (2012) I got to TechEd Orlando, only to make a fool out of myself in front of Brent Ozar (if you check his presentation, he makes fun of me for asking for a card to show his card to my wife). To conclude: while in 2008 I would have said “thanks to these guys…”, this year I’m saying “because of these guys…”. Because of these guys I still love the damn thing (SQL Server, that is). Because of these guys I’m still wasting nights, trying to pick up things on the fly. You cannot imagine the sheer joy and happiness of my wife when I have to work to replace and consolidate the database servers almost every week-end. So, if it’s all because of “these guys“, why not let them handle me? At least in part? They made me forget my initial goal, of being a hot shot, and turned me into some sort of a weird kookoo, trying to do his best. Worse part yet; because of them I got again into training, blogging, and trying to help other people.